However, he doesn’t tell us what precise role that the government may play in promoting it. To what extent is public health a domain best left to individual discretion? A defining moment came when the United States Supreme Court weighed the constitutional implications of that very question in 1905. Henning Jacobson had emigrated from Sweden where he despised the mandatory vaccination policies. Upset at facing a similar policy in Massachusetts, he refused to receive the smallpox vaccine and was fined five dollars. He appealed. So, what was the impact? The Massachusetts smallpox epidemic led to 1,565 cases in 1901, causing 270 deaths over the next two years in Boston alone. After a compulsory vaccination effort, only 108 cases arose between 1903 and 1932 of which four were fatal. While vaccination had its risks, that public health measure, buttressed by the judiciary, helped to defeat smallpox. Next, the polio epidemic assailed the heart of one of America’s most vulnerable populations: children. The disease struck an aspiring politician too, as Franklin Delano Roosevelt endured partial paralysis for the rest of his life. Fortified by the care at Warm Springs, Georgia, he later served as New York’s governor and a four-term President of the United States. While credited with helping America emerge from the Great Depression and guiding us through World War II, he also raised awareness about polio. On September 23, 1937, President Roosevelt proclaimed that he was establishing the National Foundation for Infantile Paralysis “to eradicate this disease.” According to the Centers for Disease Control (CDC), polio infected tens of thousands of people every year with increasing ferocity through the late 1940s and 1950s. Funded by Roosevelt’s foundation, researcher Dr. Jonas Salk at the University of Pittsburgh Medical School developed a polio vaccine in 1955. Dr. Albert Sabin at the University of Cincinnati developed another vaccine soon afterwards with funding from the same organization. By 1960, America’s polio diagnoses dwindled to 2,525 with no new cases since 1979. President Roosevelt fulfilled his vision of eradication. A new pandemic quickly loomed with the arrival of Human Immunodeficiency Virus, commonly known as HIV. It weakens the immune system to the point that Acquired Immune Deficiency Syndrome (AIDS) sets in, leading to opportunistic infections. The CDC first acknowledged unusual illness trends in its Morbidity and Mortality Weekly Report on June 5, 1981. Between 1981 and 1987, there were 50,280 people living with AIDS, and 47,993 of those people died. The next period analyzed by the CDC was 1988-1992 during which there were 202,520 people diagnosed with AIDS of whom 181,212 died. 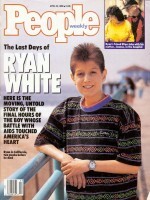 AIDS was a controversial public health topic, being most prevalent among gay men, but Americans soon learned that celebrities and children like Ryan White from Indiana could contract HIV, too. A hemophiliac, Ryan depended on blood donations to survive and was infected by contaminated blood. Four months after he died on April 8, 1990, Congress enacted the Ryan White CARE Act to address the growing HIV epidemic, using a multifaceted strategy of specialized care and education. Initially funded at $220 million, that program budget is over $2 billion today. After that, things began to change. While 257,262 people received an AIDS diagnosis from 1993 to 1995, only 159,048 of those individuals died. Then, from 1996-2000 there were 264,405 people diagnosed, and 59,807 of those died. More recently, 18,303 people were diagnosed with AIDS in 2015. In the previous year 12,333 people ever receiving an AIDS diagnosis died. About half of those deaths were HIV-related. While HIV and AIDS still remain a public health threat, the federally funded Ryan White CARE Act has made a significant difference in containing it. Whether it’s a judiciary, the President or a legislature, American vitality is key. More often than not, taking action has made all the difference. Here’s an answer: The three branches of government are accountable to each other. Yet they’re also a potent force to check that clear and present danger of our most lethal enemy: disease. Author: Reared in rural Connecticut, Jason Bowns earned a Bachelor of Arts degree from New York University, majoring in Classical Civilization and Hellenic Studies while minoring in Politics and Social Studies Education. He earned his Master of Public Administration degree at John Jay College of Criminal Justice, honing essential skills to detect organizational fraud, waste, and abuse. He’s reachable at [email protected].